Purpose: To perform a long-term follow-up evaluation of the outside-in technique of arthroscopic meniscal repair. Type of study: Retrospective study. 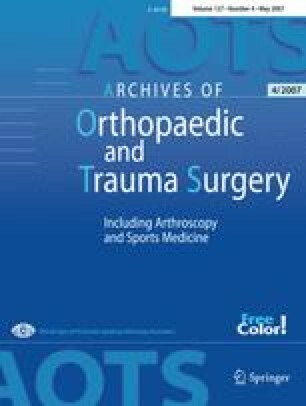 Methods: Between the years 1986 and 2002, 93 cases of arthroscopic meniscal repair using the outside-in technique have been operated by the senior author (F.L.). Forty-one patients were available for the follow-up evaluation with a mean follow-up of 11.71 years. The International Knee Documentation Committee (IKDC), the modified Lysholm score, the SF-36 (short form 36) health survey score, a visual analogue scale (VAS) for assessment of patients’ satisfaction and another VAS for assessment of patients’ pain were used retrospectively to evaluate the patients. We also used the Kellgren and Lawrence (K/L) classification of osteoarthritis to evaluate the preoperative X-rays and the X-rays done at the time of the follow-up evaluation. Failure was defined as having a meniscectomy procedure post-operatively. Results: From the 93 patients, 52 could not be retrieved for the follow-up evaluation, while 41 were available for it; 36 patients were clinically successful and 5 were considered as failure. Thirty-six patients were classified as grade “A” in the objective IKDC score, mean modified Lysholm score was 87.29 (SD 16.43), while mean SF-36 score was 85.73 (SD 14.17). The results of the VAS for operation satisfaction ranging from −10 to +10 revealed that the mean of the answers was 8.05 (SD 2.99). The results of the VAS for pain ranging from 0 to 10 revealed that the mean of the patients’ pain at the time of the follow-up evaluation was 1.8 (SD 2.42). Twenty out of 24 (only 24 preoperative X-rays were available) were classified as having no osteoarthritis pre-operatively, whereas only 12 out of the 41 patients were classified as having no osteoarthritis (normal) at the time of the follow-up evaluation according to the K/L classification which indicates progression of osteoarthritis. No complications related to the outside-in arthroscopic meniscal repair procedure were reported. Conclusion: We conclude that arthroscopic meniscal repair using the outside-in technique is a safe surgical procedure with a good clinical outcome.